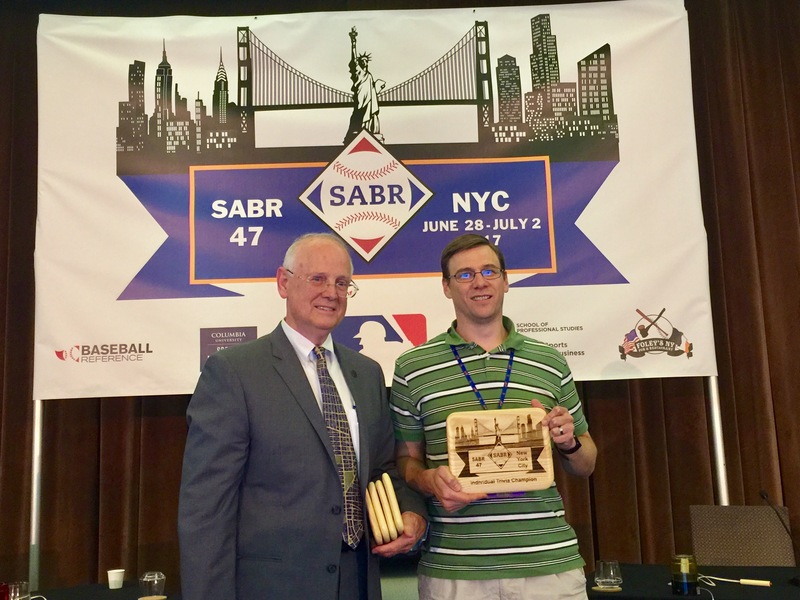 Dan Massey of Lancaster, Pennsylvania, won the individual SABR 47 Trivia Contest in dramatic fashion, breaking a tie with two-time defending champion Rob Rafal on the final question on Saturday night at the Grand Hyatt New York. Massey, who entered the second half down by 13 points, rallied to tie the score on the penultimate question about John Olerud hitting for the cycle, then buzzed in with the correct answer on a question about the Chalmers car company sponsoring the 1910 most valuable player award to win it all. Massey was also the winner of the 2014 trivia contest in Houston. Rafal, of Douglaston, New York, earned a measure of revenge in the team final, joining with past champions Mike Caragliano, Bill Carle, and Mark Kanter — "the 1927 Yankees of trivia," as moderator D. Bruce Brown called them — to easily defeat the team of Massey, Rod Merkle, Jesse Marquart, and Bob Whelan. The powerhouse foursome of Rafal, Caragliano, Carle, and Kanter — who called themselves "Boc-c-a-BELLA!" — has now combined for 38 SABR Trivia Contest championships. 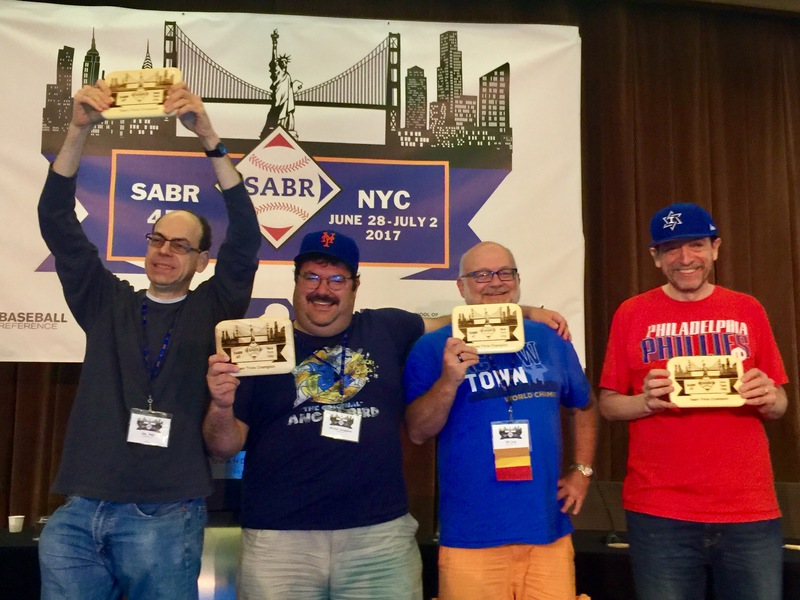 Kanter, of Portsmouth, Rhode Island, extended his overall SABR record with his 12th trivia contest win, all in the team competition. He has been part of the winning team in five of the last six years. Caragliano, of Flushing, New York, won his 10th overall contest; he is the all-time leader with four individual titles to go along with six team titles. Carle, of Lee's Summit, Missouri, won his ninth title (3 individual, 6 team) to move solely into third place all-time on the overall leaderboard, while Rafal won his fifth team title to go along with two individual. The SABR Trivia Contest was moderated by D. Bruce Brown, president of the Baltimore Babe Ruth Chapter and co-chair of Horsehide Trivia with T. Scott Brandon. Brown and Brandon wrote and edited the questions. Considerable assistance in both evening sessions at SABR 47 was given by Diane Firstman, Damian Begley, Barb Mantegani, and Blane Ferguson. Rich Klein helped with fact-checking and proof reading. Brandon assembled the game boards of the semifinal and final rounds. To view a list of previous SABR Trivia Contest winners, click here. For more coverage of SABR 47, visit SABR.org/convention. This page was last updated July 7, 2017 at 8:26 pm MST.